This study investigates the effectiveness of the Great Rides Bike Share program that was launched in 2015 in the small urban area of Fargo, North Dakota. 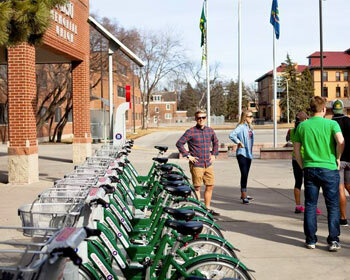 Eleven bike share stations were installed in Fargo with 101 bikes. Stations were primarily concentrated on the North Dakota State University (NDSU) campus and downtown Fargo. Primary objectives of the study were to understand user opinions on the bike share program, analyze demand for the bike share program, study the impact of the program on NDSU student travel behavior and shifts in mode shares, analyze the livability benefits from the bike share program, and analyze origin-destination trip data to understand the user trips patterns and needs.